Just a really quick post since I have to get packed to drive Lauren and I down to Dumfries for a ceilidh tonight. 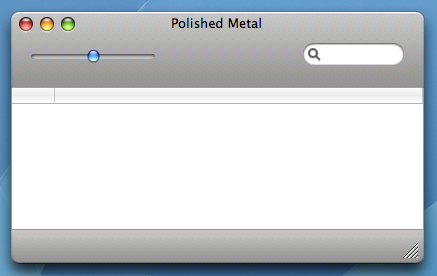 I created a little 5-minute hack to give your windows the iTunes 5 look. You can download the code here, and you can see a screenshot here. The top metal bar is there (albeit without the sharp corners; if you want them, write the code yourself and grab the graphics and masks from the iTunes.rsrc file within iTunes; they’re in the PICT resources, and you can view them and copy them with Resorcerer). The bits for the bottom metal bar are there, but the code isn’t written; should be child’s play to do it based on the code that’s there already. Make sure to also add some code to cause it to re-tile when the window is resized. If I get time I’ll polish it all up next week sometime; should be back online on Sunday night. Have a good weekend, folks, and stay classy. Update: I updated the code (details here), so it now works properly when the window is resized or zoomed, and also draws the bottom gradient on the window too. Oh, and someone asked what the license for this was; it’s public domain, so use it however you like (it would be cool if you sent me an email if you use it in one of your projects). Enjoy.